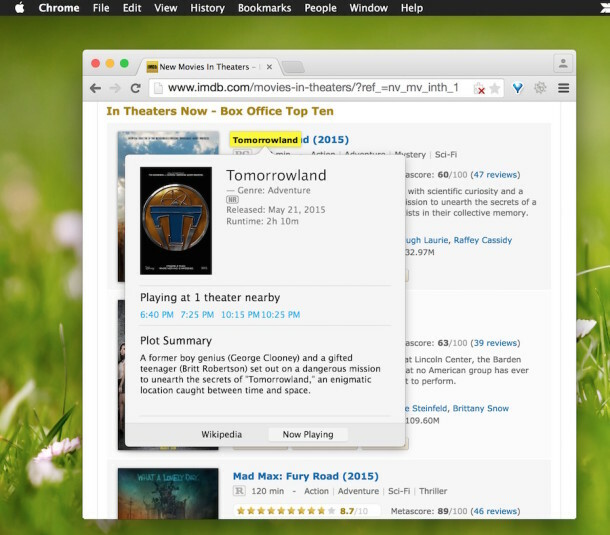 Now that you can get movie showtimes right from Spotlight in Mac OS X, did you know that you can also get movie details and showtimes from just about any webpage, document, or elsewhere that displays text just as well? 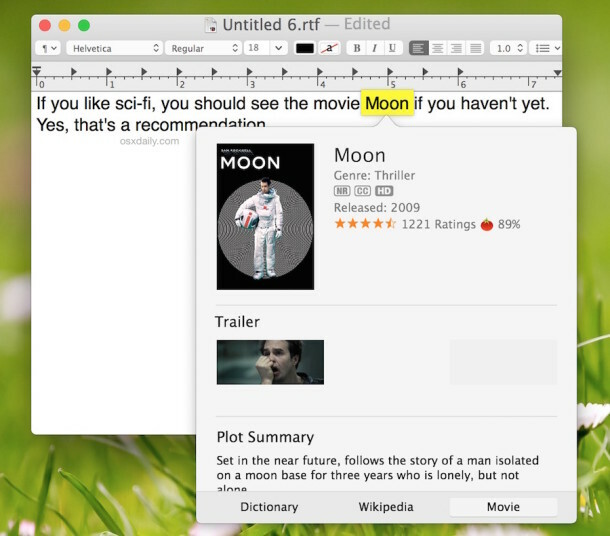 Basically, if you can select and highlight the movie text with the cursor, you can instantly get details about the movie from anywhere on the Mac. We’ll show you a few different examples of how this works, which actually uses a variation of the tap-to-define a word gesture trick that has been around on the Mac for a while. If the movie name you are highlighting is also a word (which many are), just click the “Movie” or “Now Playing” option on the bottom of the pop-up to see the movie details rather than a dictionary definition or wikipedia entry. 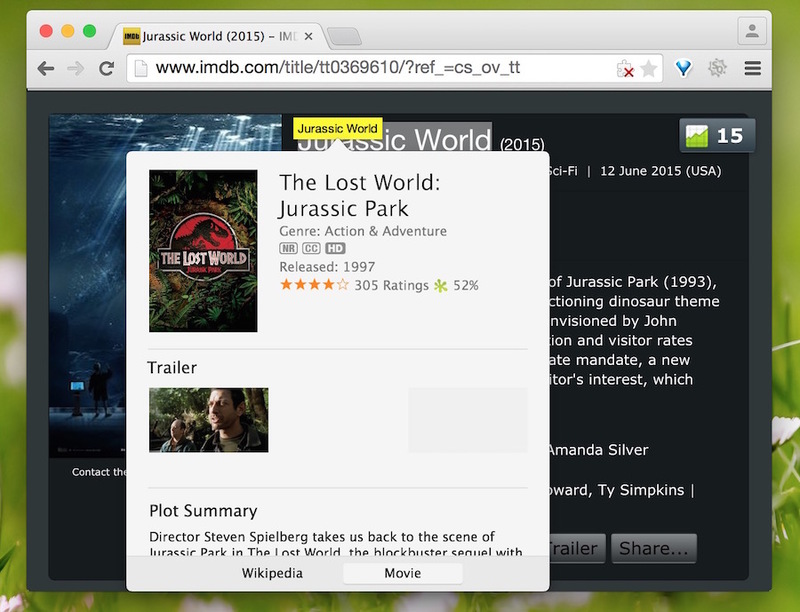 This works in web browsers, documents, and just about anywhere else, and it works the same for movies that currently in theaters, movies that are coming soon, and older movies that are available to rent or stream. If the movie is currently in a theater, you’ll see showtimes, the rating, runtime, genre, and a plot summary, much like you can access through Spotlight movie lookup. If the movie has already been released, you’ll see when it was released, the genre, ratings, plot summary, and shortcuts to watch trailers. This requires the Mac to be updated to a modern version of OS X, so if you’re running anything prior to 10.10 you won’t have this feature available to you. Heads up to Lifehacker for noticing this nifty feature. I agree with the recommendation, “Moon” is the best sci-fi movie I’ve seen since 2001! Good even if you just like thrillers! Don’t even watch the trailer, just watch the movie if you really want a surprise, the trailer gives too much away! It’s a great movie. Watch it, you’ll like it if you like smart movies! Oh and cool feature, I never knew about this. Anyone have any movie recommendations? Good sci-fi? Maybe good little known sci-fi? Good foreign flicks or indie films? Love a good movie! I’ll use the lookup feature in the browser here to read about them! This feature will not work in all countries, I’m in Thailand and i can’t get this feature, I need it badly! No, actually this works in other supported countries, but not in developing countries and small countries. The largest market for Apple is the USA, which is very organized around corporate data and consumerism, which makes it easy to gather stuff like movie details from theaters.